Dog can have their own distinctive smells and along with anything they spill, break, or carry in from outside, they can make your home smelly. Lean how to tackle dog smell problems. Household smells can be generated from a numerous sources but one of the main culprits of smell are pets, especially stinky dogs. A dog may be a man’s best friend, but a smelly dog can really test your patience! Moreover, accidents happen if one has a dog and their own distinctive smells, along with anything they spill or break, can be difficult to remove without thorough cleaning with a powerful smell remover. Dogs are one of the best pets in the world to have due to their nature. People get easily attached to a dog and treat it more like a family member rather than an animal over time. There are no rigid rules applied to a pet dog by many owners. The whole household becomes its territory and the dog can move around freely. Consequently, dog smell can permeate everything everywhere if not kept in check. Since it’s your pet, you might not notice the dog smell after a while because you will get accustomed to it, but your guests are definitely going to notice the dog smell even it’s just a slight smell. And this can be embarrassing. Dogs can leave their smells on carpets, floors, clothes, furniture, and other things they regularly come into contact with. Since dogs love to roll around and play, absorbent carpet fibers can harbor a lot of the dog smell. Cleaning and brushing a dog’s coat surely helps. If proper care is given to the cleanliness and health of a dog, the smell is bound to be less. However, in order to completely get smell out from your dog, some additional measures will need to be taken. To treat a dog smell problem, people have been known to try many homemade smell removal formulas. Feeding their dogs with sweet potatoes or coconut oil are couple of them. Using shampoos with a wide variety of harsh chemicals is another. Some of these measures, while being promoted as ‘solutions’ to get rid of dog smell, might not have any significant impact in practice. For example, how can mixing raw eggs with the dog food be a possibly good remedy for smell control? Using harsh chemicals might even affect your pet’s health in the long run. If both the safety of your dog and making your house smell-free are important to you, it’s wise to invest in a proven dog smell remover that absorbs and eliminates dog smell without harming either you or your dog. One has to find a reliable dog smell eliminator that is targeted to remove dog smell and one that really works. 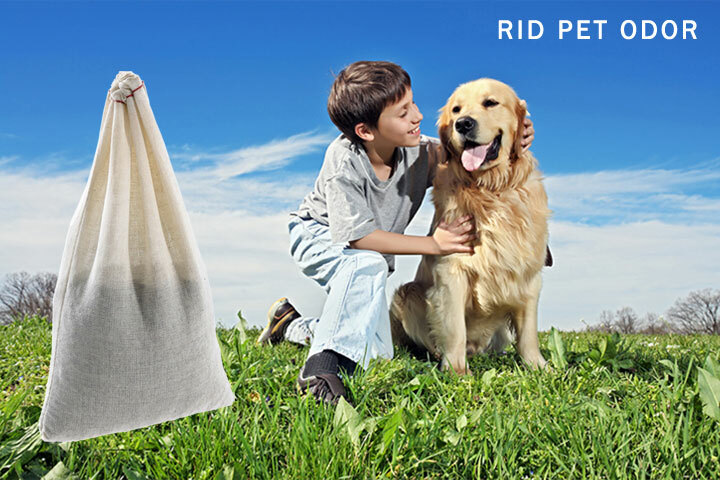 The good news for all dog lovers is that such smell removers are available from a company that specializes in eco-smart smell removal products. Tough dog smells need tough dog smell removers to get the smell out. And nothing is tougher on dog smells than the SMELLEZE™ Reusable Dog Smell Removal Pouch. It does not act directly on your pet’s body, but slowly absorbs and eliminates the lingering dog smell in your home. This dog deodorizer is completely non-toxic in nature so that there’s no risk in using it around your family or pets. It does not emit any harmful chemicals and eliminates smells without covering up with fragrances. It can also be reused for over a year so it’s very cost effective and eco-friendly. The SMELLEZE™ dog odor removers are tried and tested green deodorizers which have helped many people with a wide variety of very unpleasant dog smell problems. Very affordable at a price of only $ 12.99, the SMELLEZE™ odor removal products have been successfully used by many satisfied customers for over 20 years, some of whose rave reviews can be seen in the customer reviews section at NoOdor.com. Kim Kennedy is a freelance smell remover blogger who writes about eco-friendly dog smell removal products that get smell out from dogs as well as all other pets such as cats, rabbits and birds without covering up with fragrances. Yes, you can actually place the pouches anywhere you would like they do not have to be in the air ducts to work.